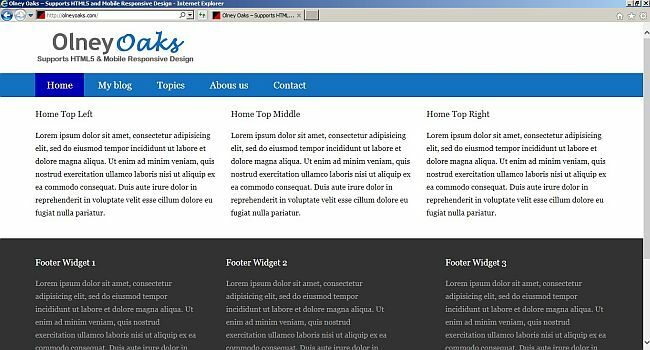 Here I am going to show you how to build a static homepage for your own Genesis child theme. In Part 1 of this series I showed you how to start building your own Genesis child theme for the Genesis Framework. To do this, you could start from scratch and build your child theme from the bottom up, but it is a lot easier to start from a basic child theme and then modify it as you want. The folks at StudioPress have a Genesis Sample Child Theme, so if you have Genesis you can download that child theme for your own use. I used this child theme to start building my very own child theme. What is a static homepage or static front page? You don’t have to use Genesis to build a static homepage for your WordPress site. WordPress itself has the capability of creating what it calls a “static front page.” So what is a static homepage or front page? By default, WordPress has what is called a blog look. It may have one or two sidebars, it may have fancy menus and complicated footers, but the main content of the homepage will be the latest “posts” presented in a reverse chronological order (latest post first). I am Roberto Fernandez Larsson and I created this site to discuss and blog about all matters related to WordPress, the premier content management system. I was a research scientist in academia for many years and later a science writer/editor and I have been playing with and designing websites for over two decades. I have worked with WordPress for several years and come to recognize its value as a complete website solution. © 2019 Roberto Fernandez Larsson · Discussing WordPress is built on the Genesis Framework.